Injecting drug use is both an urban and rural social phenomenon in Myanmar, and addressing it requires a wide geographical coverage of prevention and care interventions, especially with the high levels of HIV prevalence close to 30% already existing amongst this target group. The crackdown by different groups causes marginalized population to become more entrenched in their marginalization, and harder to reach. Subsequently, it is much more difficult to engage with people who inject drugs (PWIDs) and the distribution of needle and syringes, through established methods and interventions, is greatly reduced. These ‘crackdowns’ not only have an impact on the needle and syringes distribution and safe collection, but they also lead to an increase in the amount of unsafe discarded needles – posing a greater threat to the wider community. 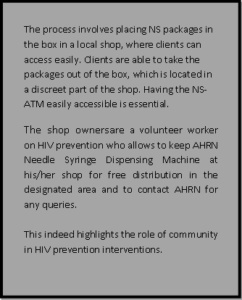 AHRN concerned with the situation conducted a GAP analysis on the impact of the crackdowns and learned that there was an urgent need to provide needles and syringes in an alternative way. 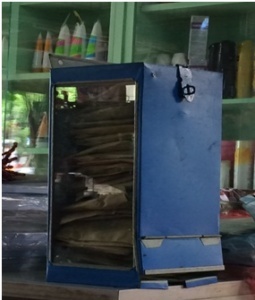 This resulted in developing the so-called NS-Automatic Taking Machine (ATM) system.